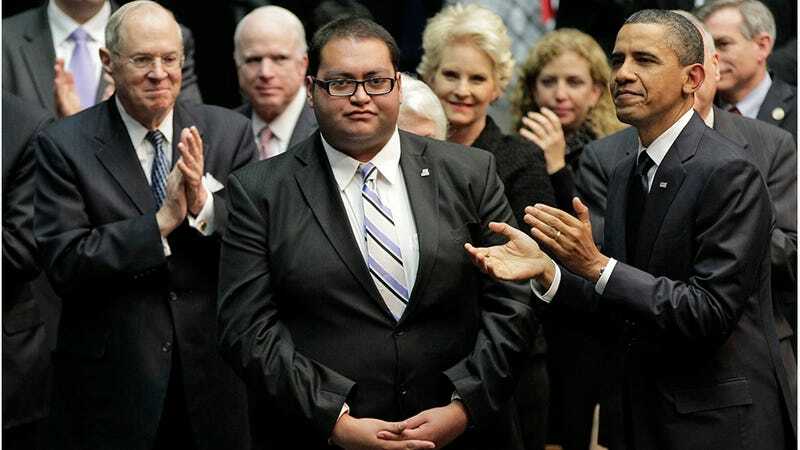 Filed to: Daniel Hernandez Jr.Filed to: Daniel Hernandez Jr.
Daniel Hernandez Jr., one of Gabrielle Giffords' former interns who performed lifesaving first aid on the Arizona Congresswoman after she was was shot in 2011, is now an elected member of a Tucson-area school board. That's all great news — except now he's being targeted by an anti-gay smear campaign that's several shades of stupid, ugly, and tired. On one side are the two opponents of superintendent Manuel Isquierdo — including Hernandez. On the other side are the superintendent's supporters, who include board president Louie Gonzales. Hernandez and fellow board member Buck Crouch voted against extending Isquierdo's contract in June, after news broke about his financial and legal issues. Community members launched a recall effort against Gonzales and another Isquierdo supporter, Bobby Garcia, a month ago. Last week, supporters of Gonzales began a retaliatory recall effort against Hernandez and Crouch. Hernandez is openly gay, and so naturally some brainiacs decided to make fliers that are all OMG HE'S GAY EWWWWW. You would think there was ONE graphic designer amongst this bunch of bigots, but I guess that's too much to ask for. I’ve had a target on my back from my fellow board members for awhile because I don’t go with the flow, and if something doesn’t sound right or make sense, I call them out on it. My governing board president has started the recall process on me, with the people who are his friends and closest allies in the community. I’m not overly concerned they’re going to get the 1,300 signatures, but just the negative tone and nature of the way they’re doing it has been really bothersome and upsetting. It’s disheartening that this is where we are in 2013, that people think it’s okay to put out these kinds of flyers about anybody. The opposition has until Dec. 14 to collect 1,300 signatures to get the recall vote on the ballot.